Orcutt’s aster is an endangered species native to California and Baja California in Mexico. Identification: This aster is a smooth-stemmed shrub less than 5' (1.5 m) in height. Leaves are variable: oblong or lance-shaped, ¾-2" (2-6 cm) x ⅛-1" (5-26 mm), with smooth or spiny edges. Light blue flowers are about 1-2½" (3-7 cm) in diameter, composed of 25-40 rays around a yellow center. (The yellow center is itself composed of 55-140 tiny flowers.) Fruits are ¹/₁₆-⅛" (3-4 mm) in size, surrounded by a bristly pappus up to ⅜" (1 cm). 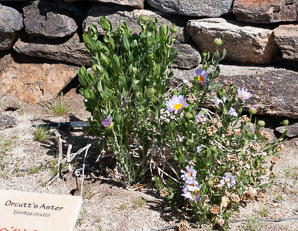 Plants are found in arid canyons at elevations of 66-984' (20-300 m). 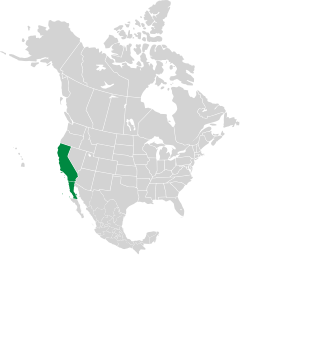 Xylorhiza orcuttii description by Thomas H. Kent, last updated 2 Jan 2019.